Here are two versions of a fun little sweater just right for spring. 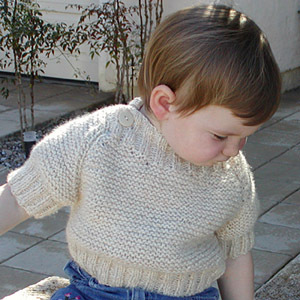 Both styles feature wide ribbing and a lapped boat neck that buttons at the shoulders. They've got a bit of style, but are definitely ready for everyday wear, particularly when knit with an easy-care yarn. 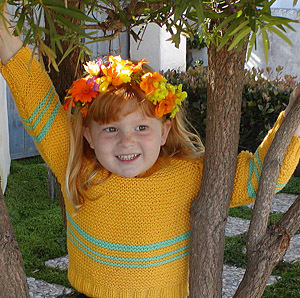 Feel free to mix and match elements from both sweaters to design one perfect for your little one -- stripes, sleeve length and body length can be used interchangeably across patterns. This is also a great pattern for sibling sweaters: good for girls or boys with lots of room for variation. Note that the gauge in a cotton yarn such as Cotton-Ease expands after wearing, so the fit will be a little looser. To work stripes as shown, after ribbing, work 2 inches in MC, then 2 rows in CC, 2 rows in MC, 2 rows in CC, 4 rows in MC, 4 rows in CC. Or make up a stripe pattern of your own. Work in k2p2 rib for 2 inches. Work stripe patt in this section if desired [see stripe pattern directions above]. Work until piece measures 6[7, 8, 9] inches. Dec 2 sts at beg of next 2 rows. 42[48, 54, 60] sts remain. On all WS rows: k1, p1; k to last 2 sts; p1, k1. This provides the subtle detailing at the raglan edges -- and makes the finishing easier! Work all decreases inside this border as follows: On RS, k2, ssk, k to last 4 sts, k2tog, k2. Dec 1 st at each end every 6th row 5 [5, 6, 7] times. 32[38, 42 ,46] sts remain. Work even until piece measures 11[13,14,16] inches from cast-on edge. Switch to k2p2 rib for 2 inches. BO all sts in patt. Take care not bind off too tightly; the edge should not be tighter than the sweater! Work as for back until piece measures 10[12,12.5,14.5] inches from cast-on edge. The front neckline is shaped with short rows. On next row: k11[14,16,18], turn, sl1, k8 [11,13,15], p1,k1. Next row: k9[12,14,16], turn, sl1, k6 [9,11,13], p1, k1. Next row: k7[10,12,14], turn, sl1, k4[7,9,11], p1,k1. Next row: k0[0, 10, 12], turn, sl1, k0 [0,7,9], p1,k1. Next row: k0[0,8,10], turn, sl1, k0 [0,5,7], p1,k1. Cut yarn. Move sts to opposite side of needle to begin working opposite shoulder. N.B. For these few short rows, you will be working all in purl st in order to maintain the garter st patt. First row: p11[14,16,18], turn, sl1, p8[11,13,15], k1,p1. Next row: p9[12,14,16], turn, sl1, p6[9,11,13], k1,p1. Next row: p7[10,12,14], turn, sl1, p4[7,9,11], k1,p1. Next row: p0[0, 10, 12], turn, sl1, p0[0, 7, 9], k1,p1. Next row: p0[0, 8,10], turn, sl1, p0[0, 5, 7], k1,p1. All sizes: Work 2 complete rows -- 32[38, 42 ,46] sts -- in garter st.
Continue in rib patt until ribbing measures 2 inches. BO all sts loosely. CO 30[32, 36, 40] sts. Switch to garter st. Work stripe patt in this section if desired [see directions above]. Inc 1 st at each end every 8 rows 5[6, 6, 7] more times. 40[44, 48, 54] sts. Work even until sleeve measures 8[9, 10, 12] inches. Dec 2 sts at beginning of next 2 rows. 36 [40, 44, 50] sts remain. As on body, on all WS rows: k1, p1, k to last 2 sts, p1, k1. Dec 1 st at each side every 4th row 4[1, 2, 2] times, then every other row 8[12,14,17] times. 12 sts remain. CO 46 [52, 58, 64] sts. Work stripe patt if desired. Work until piece measures 4[5, 6, 7] inches. On all WS rows: k1, p1, k to last 2 sts, p1, k1. This provides the subtle detailing at the raglan edges and makes the finishing easier! Dec 1 st at each end every 6th row 5[5 ,6, 7] times. 32[38, 42 ,46] sts remain. Work even until piece measures 9[11, 12, 14] inches from cast on edge. Work as for back until piece measures 8[10,10.5.5,12.5] inches from cast-on edge. On next row: K11 [14,16,18], turn, sl1, k8 [11,13,15], p1,k1. Next row: K9 [12,14,16], turn, sl1, k6 [9,11,13], p1, k1. Next row: K7 [10,12,14], turn, sl1, k4[7,9,11], p1,k1. Next row: K0 [0, 10, 12], turn, sl1, k0 [0,7,9], p1,k1. Next row: K0 [0,8,10], turn, sl1, k0 [0,5,7], p1,k1. First row: P11 [14,16,18], turn, sl1, p8 [11,13,15], k1,p1. Next row: P9 [12,14,16], turn, sl1, p6 [9,11,13], k1,p1. Next row: P7 [10,12,14], turn, sl1, p4 [7,9,11], k1,p1. Next row: P0 [0, 10, 12], turn, sl1, p0[0, 7, 9], k1,p1. Next row: P0 [0,8,10], turn, sl1, p0[0, 5, 7], k1,p1. All sizes: Work 2 complete rows -- 32 [38, 42 ,46] sts -- in garter st.
CO 40 [44, 48, 54] sts. work in k2p2 rib for 2 inches. Knit 4 rows in garter st.
Dec 2 sts at beginning of next 2 rows. 36[40, 44, 50] sts remain. Sew neckbands together at sides with ribbed sections overlapping and front side [and buttonholes] on top. Sew buttons onto back neckband under buttonholes. Sew tops of sleeve caps to neckband, then seam the raglans together. Finally, sew up side and underarm seams. 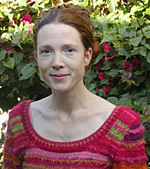 Kristi is Knitty's technical editor. She makes her home in San Diego with her husband, Leo and their daughters, Zoe  and Eleanor . When she's not knitting, she's doing something else. Pattern & images © 2003 Kristi Porter. Contact Kristi.